An entire book of recipes that my youngest son can eat? Pretty much. Gluten-free, Grain-free, Nut-free and Vegan. It is plant-based diet heaven in this massive cookbook. 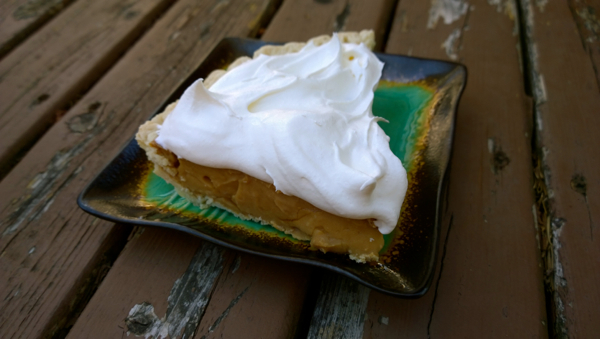 I did slightly cheat though – I used a favorite frozen pie shell, instead of using the Coconut Flour Pie Crust recipe on page 284 – I am not comfortable using pysllium husks as an ingredient, for Alistaire yet, so I went with a crust I knew he could have. To prepare pie shell, follow package directions for baking, set aside to cool. In a medium saucepan, over medium heat, stir together coconut sugar, potato starch, coconut milk and coconut oil. Cook, until the mixture just begins to bubble. Reduce heat and simmer, whisking, for 4 to 5 minutes, or until mixture is thickened. Remove from heat and whisk in salt and vanilla. Pour filling into prepared pie crust. (The recipe calls for plastic wrap on top, to prevent pudding skin. Since I like pudding skin, I didn’t do this step.) Place in refrigerator to chill for at least 3 hours. Top with whipped cream, if desired, and toasted coconut. Eat pie within 2 days. 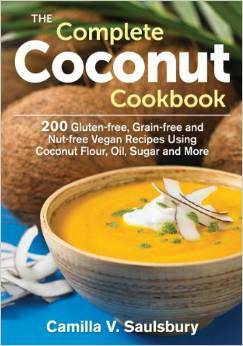 Notes: This recipe takes about 1½ cans coconut milk. While the recipe called for full fat, I used Trader Joe’s Lite Coconut Milk and found the flavor/texture to be great. Do not though use coconut milk beverage, it will be too thin and not creamy enough. Be sure to read canned coconut milk carefully, many brands have stabilizers and preservatives added now. These are not needed, and more so, if you want to make whipped coconut cream, it won’t work unless you use unadulterated milk. FTC Disclosure: We received a review copy. I made it & loved every bite, my friend! So delicious too! Yum!